The NIGHTLUX Hall multi-function luminaire shines light precisely where it’s needed. The flexible and handy LED luminaire is battery-operated and can be used outdoors, making it ideal for the front door, on pathways or in the garage. It also works perfectly as additional lighting inside your home. Its matte diffuser optimally distributes the luminaire’s cool-white light, ensuring attractive, even lighting. The NIGHTLUX Hall is easy to install using either adhesive tape or simple screws. The multi-function light comes with batteries and can be used straight out of the box. Always on hand: the battery-operated multi-function luminaire NIGHTLUX Torch comes with a practical wall mount that the LED luminaire can be removed from. This feature means the NIGHTLUX Torch is extremely flexible – and can even be used outdoors (garden, camping, etc.) thanks to its weatherproof design. The multi-function luminaire also makes a great night-light, entryway light or torch. An additional motion detector ensures you save energy and makes it possible for you to use the luminaire as an additional safety measure. The NIGHTLUX Torch LED luminaire comes with either a white or silver-colored casing. Dark cellars or stairwells are a thing of the past with the NIGHTLUX Stair multi-function luminaire. Its special design allows this LED luminaire to illuminate staircases and outdoor steps, giving you added safety and security. Light is evenly distributed and each step optimally lit thanks to a matte polycarbonate diffuser. A practical automatic mode, day/night sensor and motion detector make for even more convenience and reduce the energy consumption of this multi-function luminaire, which comes with batteries. The NIGHTLUX Stair luminaire casing is available in white or silver. The battery-operated multi-function luminaire NIGHTLUX Ceiling shines cool-white light both indoors and outdoors. 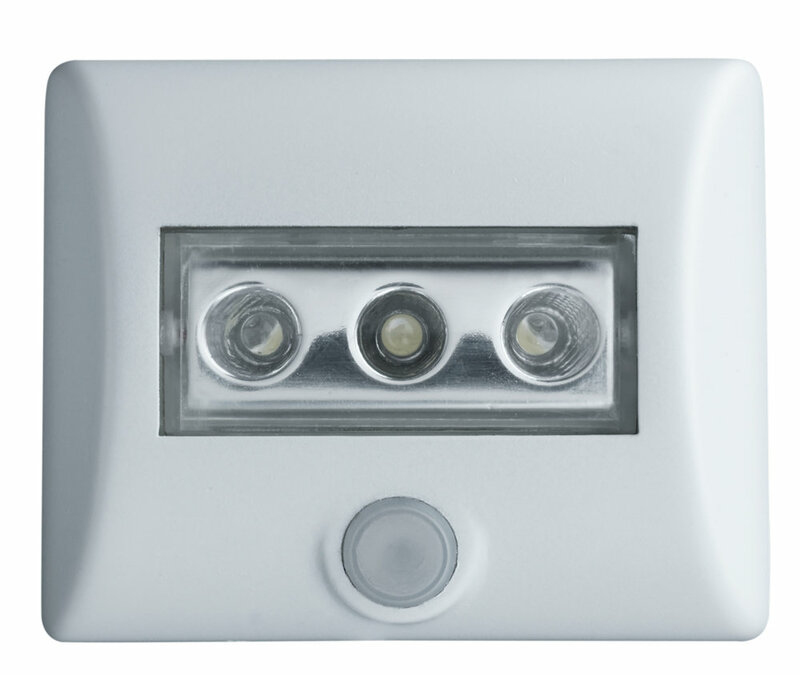 The luminaire is equipped with modern LED technology, as well as an additional day/night sensor and motion detector. The NIGHTLUX Ceiling can be effortlessly installed on just about any surface, making it ideal as a luminaire in the cloakroom or as additional room lighting. You can even use this energy-saving luminaire in the entryway or as a night-light. Delivery includes three AA batteries, and the multi-function luminaire comes in either white or silver. The splash-proof (IP54) battery-powered LED NIGHTLUX luminaire allows for versatile indoor and outdoor use in continuous or sensor-controlled automatic mode – as safety and orientation light, for example to light up dark stairwells, in basements, garages, hallways and passageways.